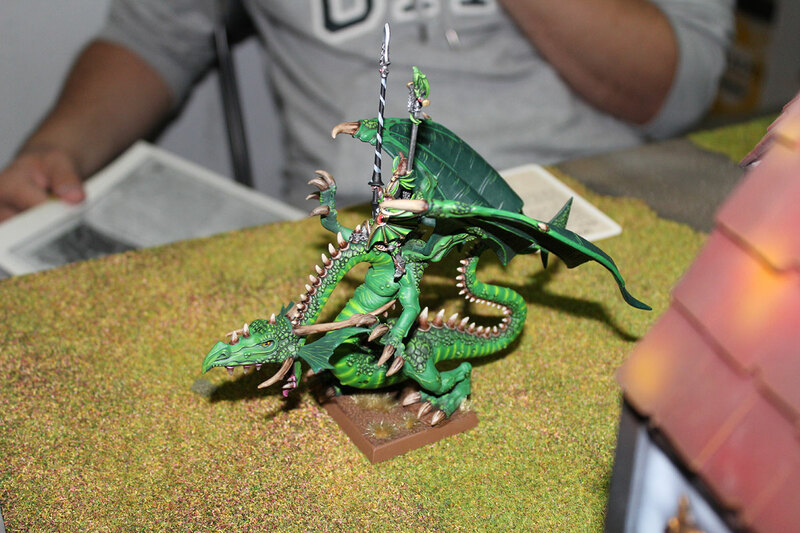 In last few days I had two battles of Warhammer Fantasy Battle. Saturday I’ve played good old Herohammer (WHFB 5th edition) – 2000 points battle against Dogs of War, and Monday I’ve played WHFB 8th edition – 1500 points vs Orcs and Goblins. I had awesome time playing those battles and I honestly I can’t decide which battle was better. Well, maybe first one, because I won that:) But still had great game against those Greenskins. I know Andrzej, Dogs of War player from Oldhammer.pl – Polish site associating players of all WHFB editions (except Age of Sigmar). And Dogs of Wars in 5th edition had really cool Army Book and awesome, really awesome miniatures. So this battle were exceptional. Do you remember Dogs of War? Regiments of Renown of Tilea and other lands? Mercenaries for hire are not available any more, but 5th and 6th edition were full of different types of units. Pikemen, Ogres, Dwarf Slayers pirates, Bearmen, Birdmen…and many more! Real class act! And now I had the pleasure for the very first time play full battle against these mercenaries. No really! I played against individual regiments hired by other armies many times, but never against whole Dogs of War army. The story of glorious victories and uncountable gold and warp tokens is about to begin here and now. The story of young and ambitious Skaven Warlord Scrivisk . Warlord Scrivisk’s life is a story of success ( at least so far). He was the strongest and biggest rat from his breeding hole. Quickly he became strong and adult enough to receive warrior training. Shortly after he was recruited by Clan Skitterbite. Many battles he fought, many wars he experienced – and step by step he begun to climb up in the society ladder. Promoted to Chieftain, he started to gather his small personal loot. At one point of his life, he decided to follow rather unusual thought. He felt strong and confident enough to climb higher. The role of Chieftain in Clan Skitterbite was not satisfying for him. Typical way of things was to challenge Warlord of Skitterbite, kill him and grab his position and wealth. But Scrivisk was after something more. He wanted to be famous – the name of Scrivisk needed to be known everywhere across under-empire and in man-thing realms. He wanted, that his name will mean fear and respect. For that, he needed his own clan. His first target – the Tilean city of Rimine, inside borders of Principality of Miragliano. It looked like easy task for the start – quick, surprise attack and loot the city, gather some gold and slaves and withdraw. It happened otherwise. Skaven army was spotted by Tilean scouts just before they entered Principality’s territory. Of course travelling by underground tunnels would by more convenient for Scrivisk and his Clan, but transport of war machines forced Skaven to travel above. And Tilean scouts were carefully watching their doings and they managed to warn the city. 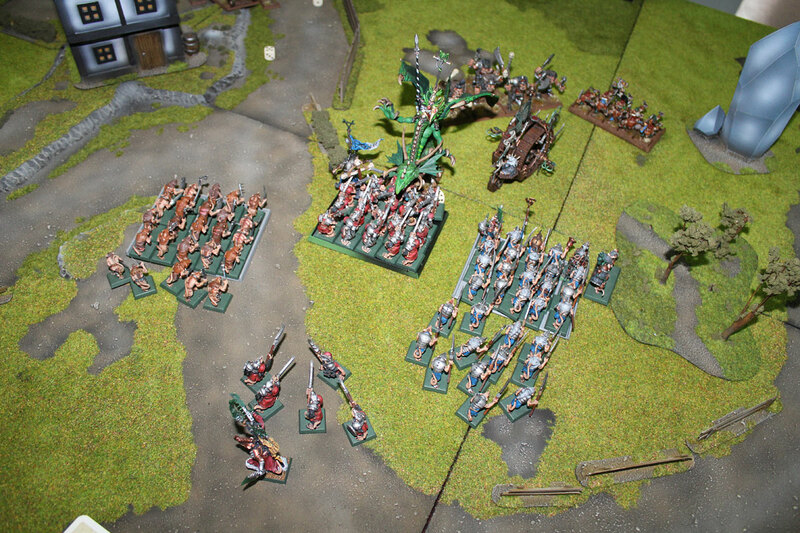 The Army of Miragliano was sent to stop Skaven raiders. 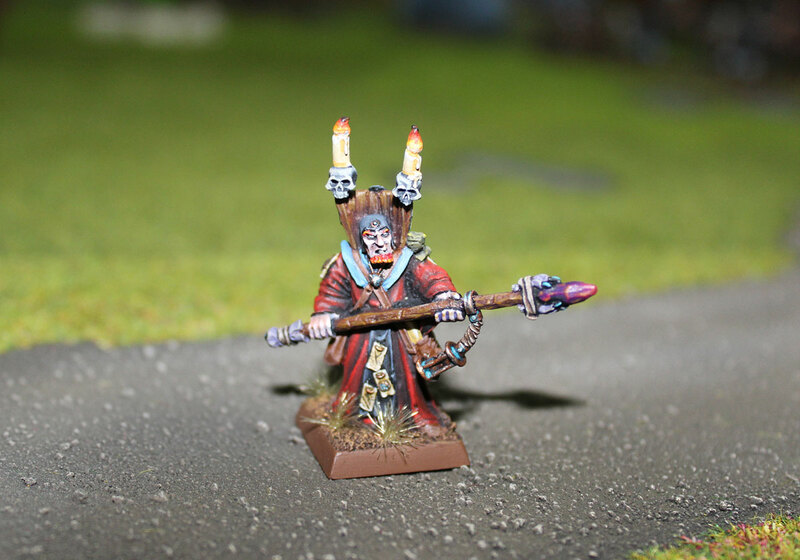 ..and these models were so amazingly painted. Just look at that! As additional restriction – we decided to use rules for Tournaments from Battle Book. No special characters. No 4 level wizards. No unridden monsters. And no magic items worth more than 50 points. If you have any question about these old rules, just ask. I will be more than happy answer any. Skeven were on the southern side of the Rimine settlement, and Miragliano expeditionary force were coming from the north, hurried to stop invaders. Before the battle, Champion of Stomvermin prepared th hot, boiling pot of Skavenbrew. All Stormvermin ate their portions and almost right away their eyes glowed with hatred. Those Skaven potions are truly amazing! Skaven army. Starting form the bottom (western side): Mark 5. Doomwheel and Slaves unit behind it, Stormvermin led by Scrivisk and Rotmash, Clanrats with Two Clan Skryre agents and Assassin, Warpfire Thrower and finally Mark 5.Doomwheel on far eastern corner of the battlefield. Dogs of War were started at the north – near the Rimine town – Dragonlord was hidden behind the buildings, but next from the left: Galloper gun led by Bronzino himself, Wizard General Andrela de Remine, Golgfag’s Mercenary Ogres, Long Drong Slayer’s Pirates, and two Galloper Guns on the right. Don Andrea de Rimine looked at his army from the distance. They were surely tough and experienced lads. They will get rid of this vermin infestation in the matter of hours and his city will be safe again. …where was exactly Asarnil and his Dragon? He didn’t like to receive orders from anybody – independent and proud Dragonlord…but after battle he was always wanted his part of the payment like all the rest…On the other hand – The Dragon! Powerful, powerful ally! Asarnil and his Dragon went fly high. Don Andrea looked at the sky – far far away, at the cloud, flying so high, there he was – Dragonlord on this faithful dragon, ready to nose-dive and charge Skaven regiments. Don Andrea nodded at Bronzino and he shouted to all of his Galloper guns – FIRE!. All three guns shot at their targets. First one, near the settlement shot at old Mark 5. 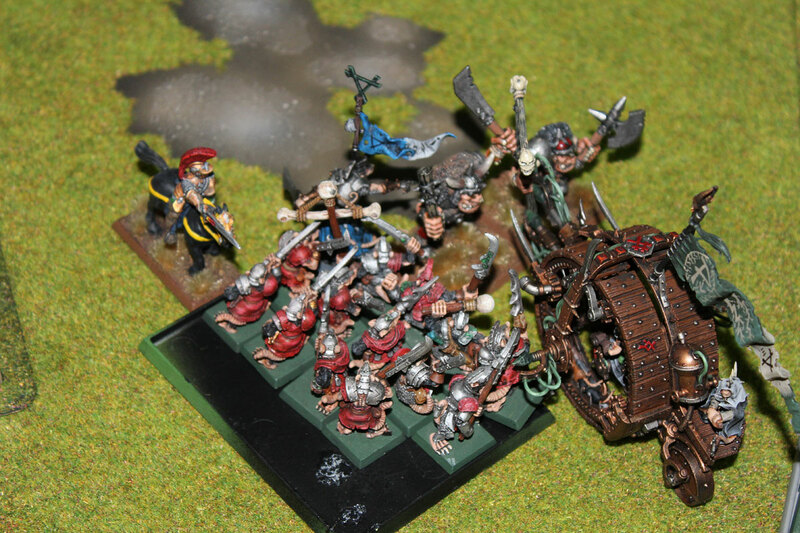 Doomwheel – the hit was direct, but Skaven war machine was old but resilient. The cannonball did not penetrate the armoured construction. 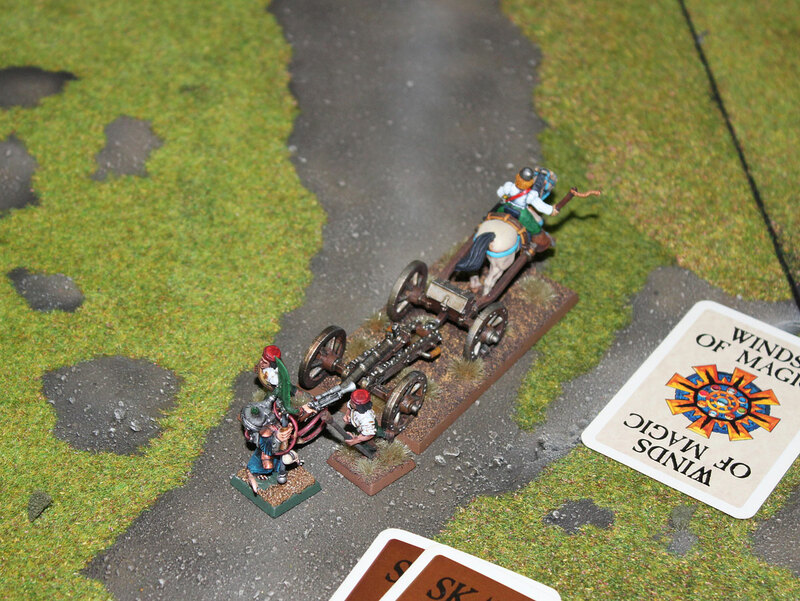 Too bad… Fortunately the ball bounced forward and killed 5 Slaves from the regiment lurking behind of Doomwheel. First Blood. 5 Skaven Slaves dead..
Hurray for Bronzino and his gun! First Blood shed! Lord Scrivisk just smiled, when he saw the mediocre shooting of Battery of Galloper Guns. Man-things are weaklings! They are no match for Skaven! Let’s show them the power of Clan Skryre’s machines! …and he ordered all of his army to advance. Doomwheels rolled forward. Stormvermin, Clanrats and Slaves proceed right behind them. The roar of Deathfang The Dragon echoed upon the battlefield. Asarnil was diving, right onto unit of Stormvermin! The wrath of the Dragonlord will be furious! Dragonlord charged from the sky! Ogres and Pirates marched forward. Bronzino ordered his Galloper Guns to manoeuvre slightly and aim at their targets. Don Andrea was confused after loosing his powers so he moved back to one of the buildings. The gun blew up killing whole crew. Two other guns performed just a little bit better (at least they didn’t blow up). Second gun hit the Skaven Warpfire Thrower, but the ball bounced with the power so weak, that there was no harm done to Skaven crew. Third gun managed to kill only one Stormvermin. Not very fruitful shooting… Not at all. Brave Stormvermin stood against Dragonlord’s charge. That moment of the battle was crucial. Lord Scrivisk ordered to attack – Take them all! Kill all weaklings! Kill big liz! KILL-KILL!. Clanrats moved little bit towards Long Drong Slayer’s Pirates. New Mark 7. Doomwheel charged into unit of Mercenary Ogres, Slaves marched at the Bronzino and western Galloper Gun and Scrivisk pushed trough Stormvermin to kill Asarnil personally. Older Mark 5. 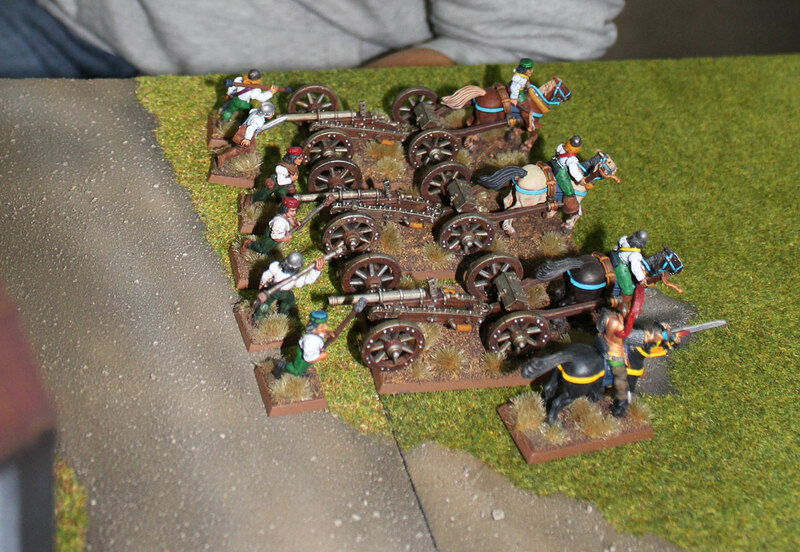 Doomwheel closed to the Pirates left flank. 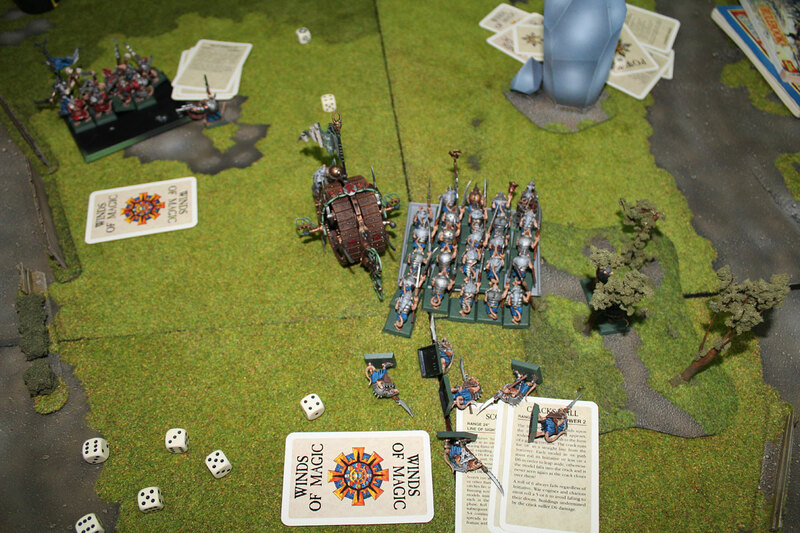 New version of Doomwheel released three lightings into unit of Ogres. Two of them were fried to the death at sight. Second Doomwheel, that near the Slayers Pirates had similar plan. Zzap the enemy. Unfortunately the Warpstone Generator malfunctioned and no lightnings went off. All deciding combat were in the middle of the battlefield. ..but when the new Doomwheel rolled into the Ogres, it ground one more mercenary with its destructive impact, but the controller and rats were too weak too do any harm to Golgfag and his sidekick. And the response from Ogres were powerful. They killed warlock engineer, so nobody had control over this machine. This could end badly for any of sides! Meanwhile, Asarnil and Stromvermin were still clashed in dreadful fight. Asarnil took out his sword and attacked Scrivisk. 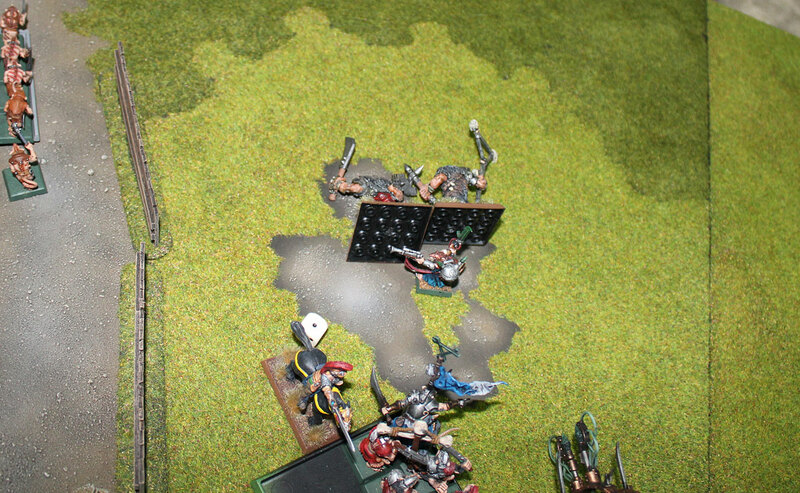 He even managed to wound him – at least he thought so, but at the very last moment the protective power of Black Amulet saved Skaven Warlord and rebounded the hit to Asarnil. Response of Scrivisk was mortal. He struck Asarnil at his chest with poisonous Weeping Blade and took his life. That was last breath of brave Asarnil and Skaven lord could be triumphant! Deathfang – the faithful dragon roared with grief. His master was dead, there will be no one to fly again above the clouds! He swung its claws and kill two Stormvermin with fury, despaired enough to protect the fallen body of its master to the end. But Skaven were surrounding Deathfangfrom all sides. There were too many of them, swarming like little bugs. Deathfang was mighty and fearless creature, but even his spirit could be broken, when there were too many enemies. He started to falling back! Skaven were shouting with triumph. Deathfanf tried to fly away, but some of the Stormvermin already climbed at his wings and started to cut them with their halberds. 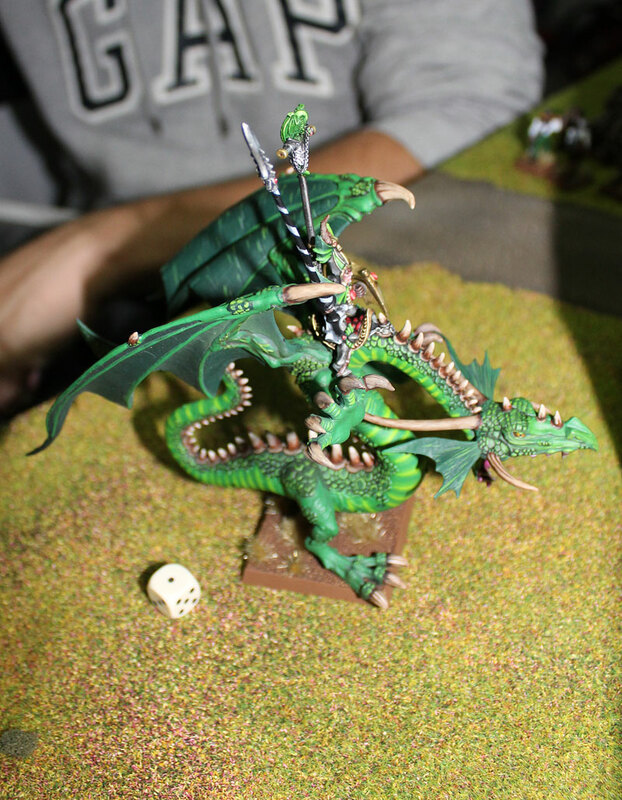 Dragon was fleeing, but Skaven were faster – jumping over his back, and wounding him fiercely. It was the end of this powerful Dragon. Scrivisk stood for a while and cried with proud! (Dragon was broken from combat and he rolled 9 on 2D6 for flee. Meanwhile Stormvermin unit rolled 10 on 2D6 for pursue. 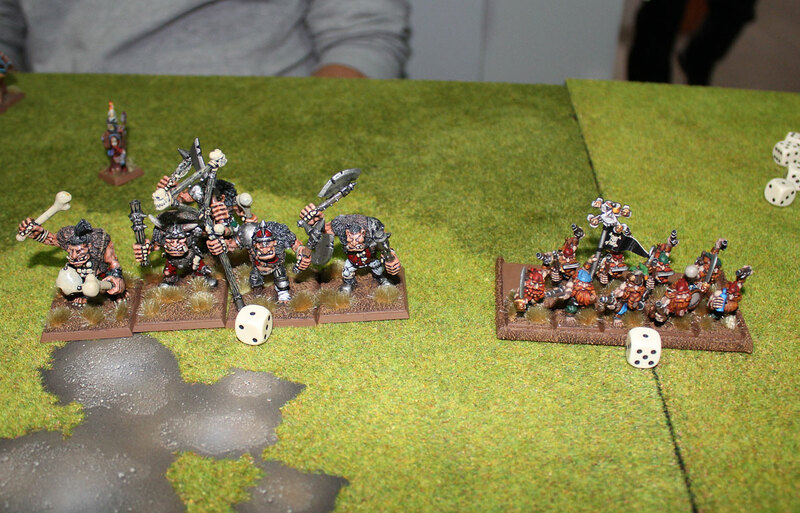 What a lucky rolls for Skaven:)…but only for a while. 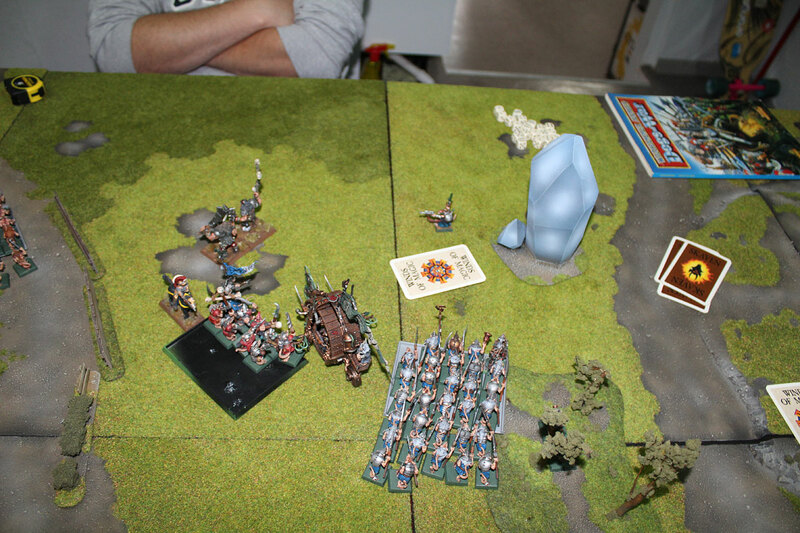 Dragon was dead, but Ogres unit was so close, so he ordered charge at them from the flank! More blood and glory for Scrivisk! Asarnil was killed by Scrivisk and broken Dragon fled from combat. 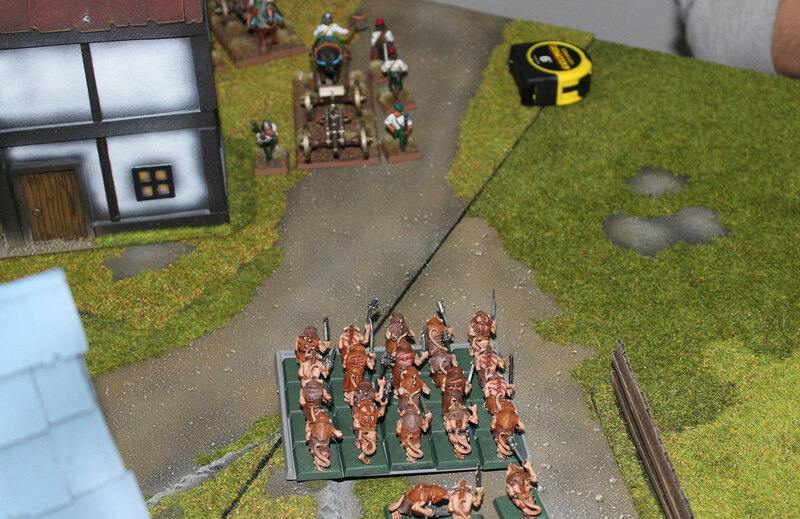 Stormvermin pursued and caught the beast and charged at Ogres regiment. Both of Clan Skryre’s Warlock Masters watched moment of Scrivisk’s triumph from front rank of Clanrats unit. They were preparing to perform their part of warmongering. All Pirates killed by The Plague spell, but it also annihilates Skaven Doomwheel! The second Master Warlock – Warvolt of City of Pillars, at the same time, casted Skitterleap at himself. The powerful spell of teleportation – he vanished and reappeared instantly ready to charge Galloper Gun on the east. Gun crew was probably little bit surprised with this sudden appearance, because they decided to flee. They fled fast and left the battle to live and fight another day. Master Warlock Warvolt skitterleaped to fight Galloper Gun’s crew….but the fled away. There were not many Dogs of War left on the battlefield. Bronzino decided he got nothing to loose and charge Stormvermin on the flank. Don Andrea hid in the basement of one of the buildings. 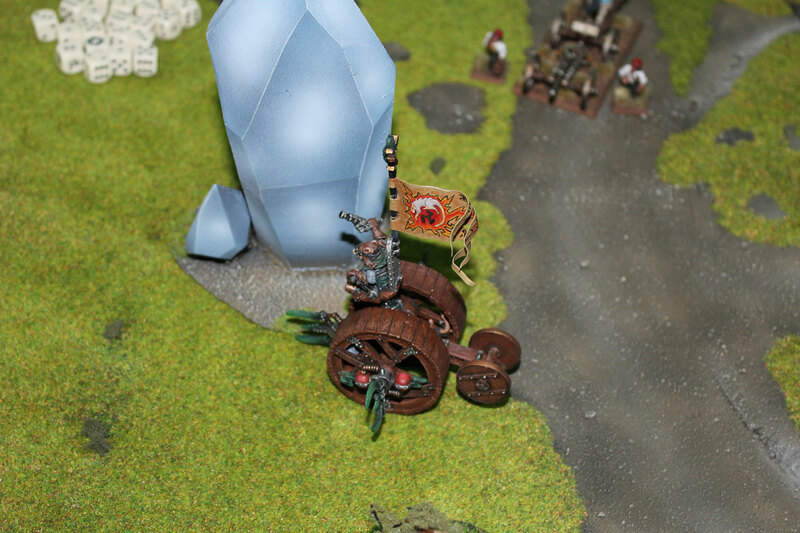 Ogres were fighting the Doomwheel and Stormvermin, and remaining galloper Gun moved back and fired at Slaves. It’s possible that Gun’s crew were little bit broken, that they are the last gun on the battle, because they missed unit of Slaves completely. That was total miss! Bronzino’s brave charge on the other hand was amazing. He slew 3 Stormvermin and Golgfag added 3 more to the body count. Scrivisk couldn’t even managed to hit Golgfag in return. Stormevrmin remained strong tough and they did not flee the combat. Shiny, golden Crown of Command on Scrivisk’s head was true morale lifter. Slaves were after last Galloper Gun. The combat continued. Stomvermin and their leader – Scrivisk are brave and skilled warriors, but this time they failed to inflict any wounds – both to Bronzino or Golgfag. 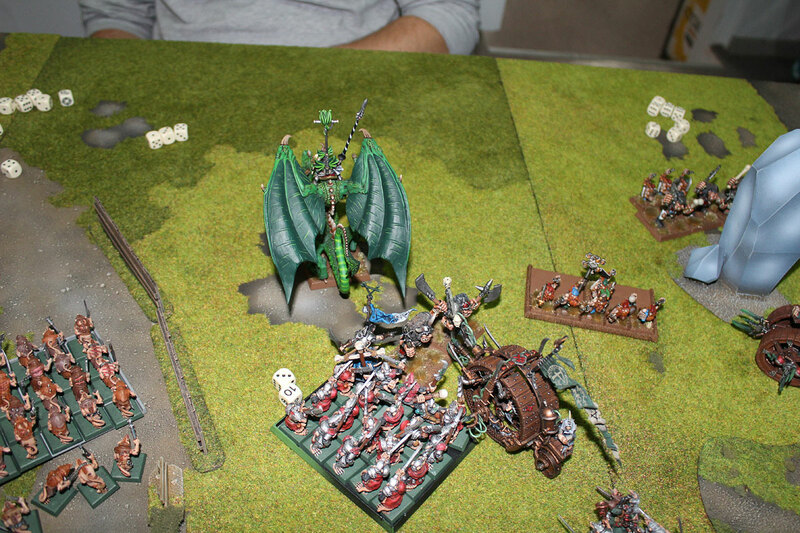 Lucky for Skaven Mercenaries also flighted like a fair maidens and did not bring any damage to Stormvermin. The magical War Banner of Stormvermin blew on the wind proudly and still there were more than 10 of them to fight. Golgfag started to calculate in his head – Too many rats… Too many, I can tell…let’s go lad. We are not staying here! The Ogres broke the combat and fled. Bronzino was last man to fight! Mercenary Ogres fleeing the combat. ..and that was the moment that Warvolt could show off again. He reached for Winds of Magic and took Total Power to his body. Nobody could resist so powerful, cumulated energy, so he casted Skitterleap again on himself. No possibility to stop or dispel the spell. He disappeared and teleported himself near broken Golgfag and his Ogre buddy. It was terrible death of rest of these once proud mercenaries. They were too surprised and too shaken to defend themselves. Warvolt’s halberd cut swiftly and with no mistake. Ogres fell dead. Master Warlock Warvolt skitterleaped and killed fleeing Ogres. Without any support Bronzino had no chance against Scrivisk and his bodyguards. He decided to fight to the end. 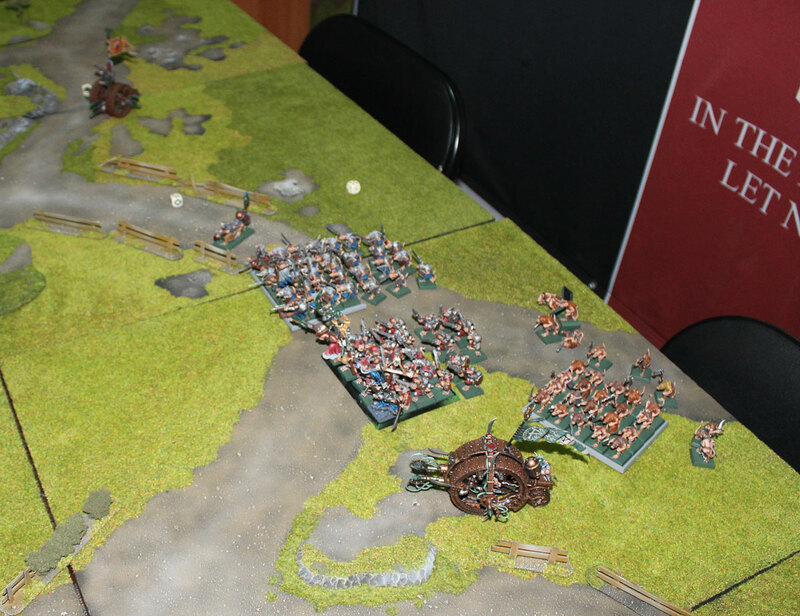 Of course – last Galloper Gun shot 3 Skaven Slaves, but it was deed of desperation. Nothing could help the city of Rimine. The battle was lost… but he fought bravely. He was alone against whole unit though. His morale was low and even he realized it was no point to fight any more. He fled the combat, Stormvermin pursued him…and they caught him. He was not fast enough for incoming fury of Skaven. Bronzino was dead. This was last unfortunate accent of The Battle of Rimine. City was ploundered by Skaven. Lots of gold were looted, many Slaves were taken captive, but what’s most importnat – Scrivisk got the name for his Clan. After the battle, people of Tilea was talking about Vermin of Rimine. The word – Virmine as a short version of this events came to the common language. Scrivisk liked it a lot – so it was decided – Clan of Virmine. From now on the world will know his Clan under that name. He also chose the colour for his Clan – he ripped of the banner of Rimine – white and blue colours with golden rooster inside, he threw it to the mud and he knew that these dirty rugs will do just fine as a decoration for his banner pole. And all of his Clanrats started to wear the same colours from now on. The Glory of Clan Virmine was absolute. That was great battle. Andrzej, thanks again for the nice game. Someday we need to repeat that. Today I was supposed to to play one more battle of Herohammer (vs Empire) – but we was forced to rescheduled the battle for some other day. And look at that! I got the name and the story of my colours. I wrote, it will come easy with the first battle:). Funny story with the warlord’s name – Scrivisk. Right before this battle report I was watching Little Shop of Horrors and one particular character caught my attention – sadistic and mean dentist – Orin Scrivello, played by Steve Martin. What can I say – he was inspiration for the name and his personality. One of my favourite movies ever! Soon more battle reports of Warhammer Fantasy. Great, great battle report. Thanks for writing and sharing!